A Baby Cried Nonstop Until They Found THIS Terrible Sight. It's A Warning We ALL Need To Hear! 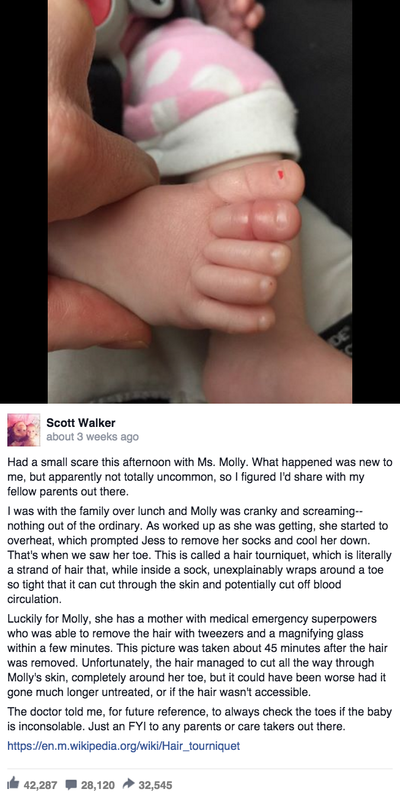 When Scott Walker's baby girl, Molly, wouldn't stop crying, he would have guessed a million reasons as to why before ever guessing the true cause of her distress. But after removing the infant's socks to help cool her down, he was shocked to uncover a toe that was severely swollen and red. And now he's taken to Facebook in an attempt to warn everyone of this highly common danger most folks don't even realize exists! 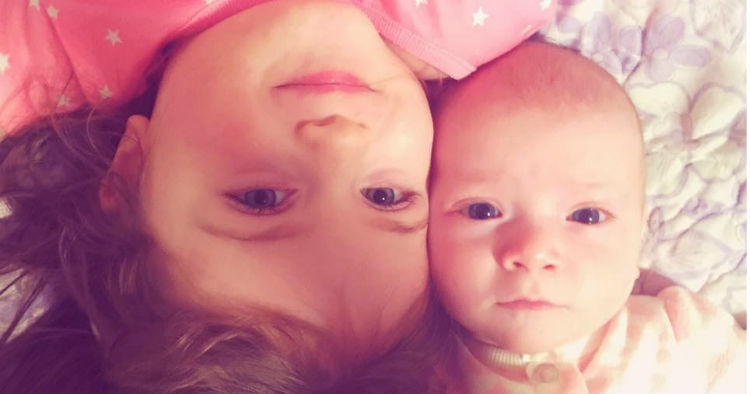 “Molly has been battling some colic and reflux issues for the past couple months, so being agitated is nothing unordinary, for her, but something seemed ‘off’ this time,” he said. With all the screaming, the little one had worked herself into quite a tizzy and was starting to overheat. 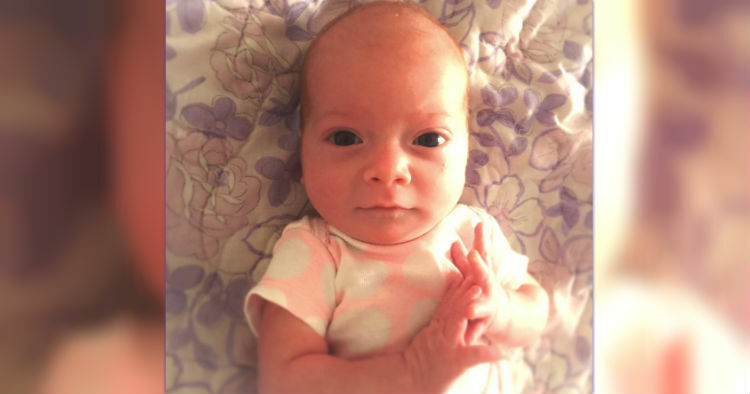 As mom and dad began removing some of her clothing, that's when they made a startling discovery. Jess pulled off Molly's socks and noticed her toe looked odd. 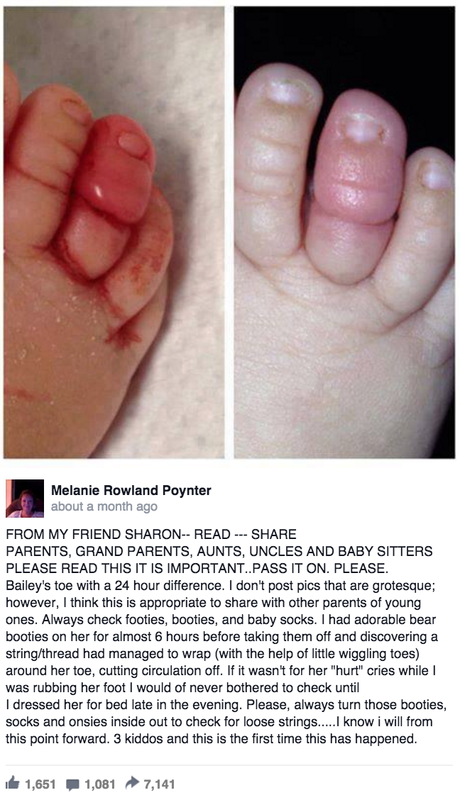 Closer inspection revealed that a tiny piece of hair had wound itself around the infant's toe, cutting off the circulation. The same thing can happen with strings that pull loose from inside a baby's socks. 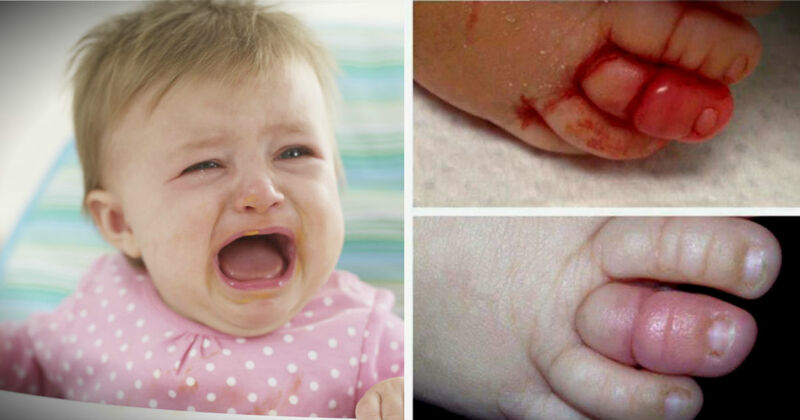 The condition is called toe-tourniquet syndrome (also called a hair tourniquet) and is extremely dangerous for the little ones it affects. Using a magnifying glass and a pair of tweezers, Jess was able to quickly remove the "hair tourniquet" from Molly's toe. The strand of hair had cut through the skin, but the sweet girl was otherwise unharmed and quickly returned to normal. But Scott says the doctor assured him that it could have been much worse had the hair not been removed or had it been inaccessible. And that's exactly why Scott, along with other parents who've experienced this condition, are using social media to get the word out about this common danger.